You now have the possibility to manage the depth of the blocks located on your website background page. That is to say that you can bring them to the foreground or background, in just one click. The background blocks used to be configured by default to be placed under the page blocks. Now, they can be moved to the foreground, above the page blocks, according to your needs and tastes. 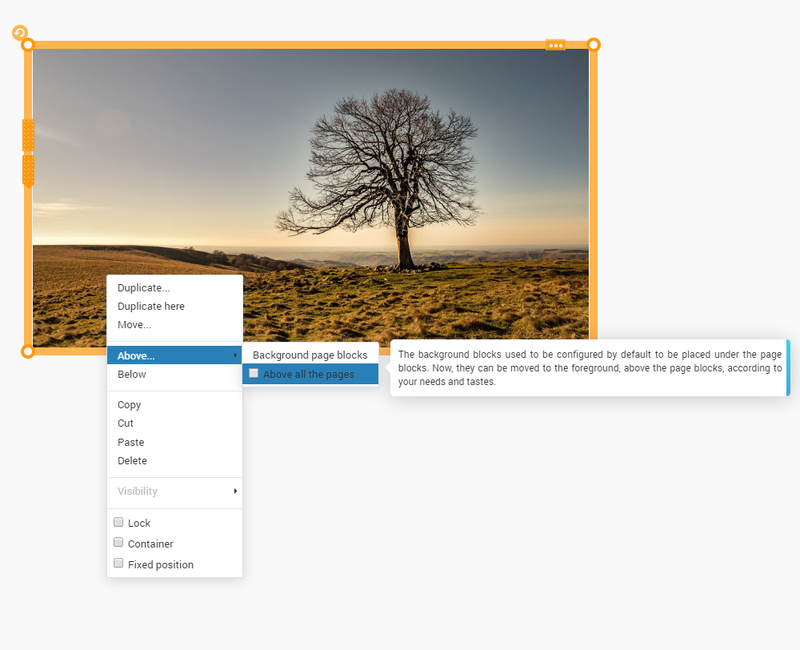 The Menu blocks used to be configured to always be above the page blocks, but you could not bring one to the foreground or background, in case they overlapped. It is now possible to easily manage the depth of the various Menu blocks. How to manage the depth of these blocks? Once again, it is very easy: you just have to use the Context menu that appears when you right click on the block you want to configure. Then select the function: “Above all the pages”. Use this brand new function to refine your website design!